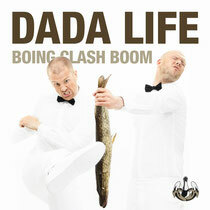 On the back of a good start to 2013 Dada Life release another track from their album, ‘The Rules Of Dada’. Out now, ‘Boing Clash Boom’ is the next offering, complete with a host of remixes that the Swedes have personally signed off on. These come in the form of Bingo Players, Pierce Fulton and Major Lazer (AKA Diplo), who have been selected to provide their interpretation of the track. With a thudding bassline complimented by vocals throughout saying “bring on the bananas and bubbly” and “lose it”, the hard-hitting drop in the original mix is what you would expect from Dada Life, as it builds momentum throughout. With BNNS (Dada Life’s fans) ready to join them across festivals and dance floors this summer, Universal Music’s specialist dance division, PM:AM, has released the remix bundle now.